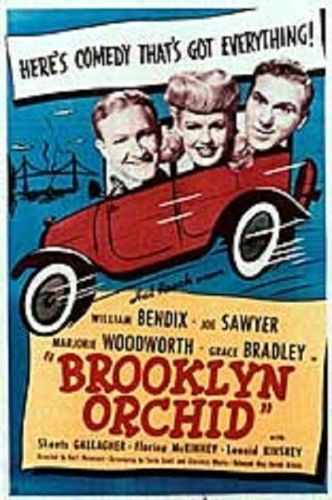 Hal Roach Studios' Brooklyn Orchid was one of three "streamliners" (films running between 40-50 minutes) starring William Bendix and Joe Sawyer as a pair of nouveau riche taxi drivers. While vacationing with their wives at a swanky resort, Bendix and Sawyer rescue beautiful blonde Marjorie Woodworth from drowning herself. Far from grateful, Woodworth demands that the two dunderheads take care of her now that they've saved her. Our heroes spend the rest of the picture trying to elude the predatory Woodworth and to keep their wives in the dark. Brooklyn Orchid is essentially an expanded version of Hal Roach's 1931 Laurel & Hardy 2-reeler Come Clean.